In view of the continuous and inexorable increase in the costs of traditional energetic sources, it becomes even more strategic to find alternative solutions that permit the costs for the production of energy to be lowered. Among the techniques and alternative materials, coal and petcoke are those mostly revalued at a World level. To be able to use in a productive way such products which have the maximum combustive efficiency, the maximum energetic output and consequently the least pollution in terms of volatile dust emissions &sulphur ,the product must be milled to very fine particle sizes. Plants and Machinery realized by SBM Machinery are perfectly suitable for the treatment of such raw materials on a particle size level as well as production level. • Pre-drying stage: This phase is necessary in cases where the raw materials rise above a certain humidity threshold (>9%). 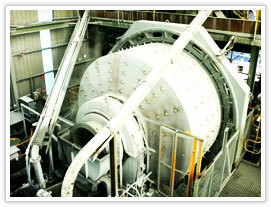 • Grinding/Micronization: This occurs through one or more roller mills which apart from milling to extremely fine particle sizes 90micron) also supplies further drying to the raw materials (phase that with humidity inferior to 9% makes the drying stage inside the mill itself not necessary). • Classification: by means of air separators capable of selecting the fine powders under the desired separation cut and reintroduce the rejected materials in to the grinding cycle.